First you start with an idea. It’s where most people begin. You know, “Oh, I MUST make a shrine to chocolate!” Or Elvis, or Russell Crowe, or Barbie, the Banana Splits, or the Planet Melmac. But where you should start–and of course, we never do what we should–is with the container. The container should be small, of course. I mean, where will it go? A dashboard shrine may fit nicely in a small candle sconce, or a matchbox. Something for your pocket might go better in a matchbook, a film canister, or slide out of a gutted dental floss dispenser. The point is, the container determines everything. Unless you want to collect images and then scan them (or color photocopy them) down to size, start with the container. Containers should meet the “three Cs” requirements: Cheap, Clean, and Compact. Charming is optional, kitschy is a plus. So anyway, find your container. I highly recommend glancing in your trash right now, to see what you’ve thrown out recently. 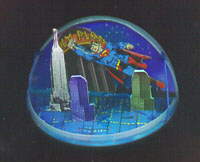 One of my favorite shrines is shown above, the Superman shrine built in a Pringles potato chip lid. But anyway, let’s assume you have a few containers gathered. Your theme can be absolutely anything. Select a person, place, idea, event or holiday. I’ve already listed a few, but don’t stop there! Movie idols, personal obsessions, fetishes, and weird/quirky stuff is what we’re looking for. Serious topics? Why not? Draw on your spirituality, or history, or your dreams. But find a theme anyway. Maybe it starts with a toy you bought at random from the 25-cent dispensers at the door of the grocery store. Or the fortune card you received at the penny arcade. Maybe it’s about spike heels, condoms, bubble bath, the Trix rabbit, or Elmo… or a scary combination of some of these! The thing is, you need a fairly clear vision/theme. You can adjust it as you find trinkets and images for your shrine, so don’t get totally locked into one idea. It’s time to collect bits and pieces to go into your shrine. You already know the size you’ll need…something which will fit inside your container. Also, think in terms of dimension. Flat shrines are fine. No problem. But, you can raise some elements above others, with foam tape or little blocks or something. Images are best if they’re the right size. With a scanner or photocopy machine, you can reduce any image to the right size. The library may have some fabulous books for inspiration. So, once you have your bits & pieces, you’ve reached the assembling phase. The first issue is glue: Even “permanent” glue sticks dry in high heat and/or low humidity. The pieces fall off. Yep, done that. Another poor choice is rubber cement. It can yellow and/or turn paper translucent as the years progress. One brand claims to be archival, sort of. Read the label, and decide for yourself. Be prepared to change your mind about what goes where. Spontaneous art is the best art! All done? Congratulations! It’s time to display your work. Dashboards are good. So are office desks, copy machine tables, and so on. Put a pinback on it, and wear it. Oh sure, you can tuck your shrine in your pocket or purse, but you must promise to take it out regularly, and enjoy it. Pocket shrines are made to display, show off, and flaunt. Pocket shrines are FUN! Enjoy!